Your Family, Agile, and You: Are we overloading our kids with tasks? And if so, what can we do about it? Are we overloading our kids with tasks? And if so, what can we do about it? The answer is simple. Focus! If you want to get your kids to perform their chores, one of the most important factors is focus. This is one of the keys to your success. The task board is an excellent solution for scope and focus our attention over the most important tasks and getting them done. Sometimes we get to the point where our kids feel like they have too much to do. This might even be because of us, the parents. Not because we give them a lot to do, but because sometimes even a few simple (to us) tasks seem huge to our kids. Sometimes we forget that they aren’t really small adults at all, but children. Children who aren’t very experienced at setting goals or priorities. Even I can get stressed out from a list like that, and kids take it even worse. Homework is also a task that can cause stress - what seems simple to us, like four pages in English and two in Maths can create a feeling of pressure to get the tasks done. Ask him to empty the dishwasher as well, and you’ll find that it’s too much for them to handle. If we succeed in changing the way they perceive their tasks, then we will be able to change the feelings that follow hearing about these tasks as well. So for example, there are tasks that we can head off the pressure before they start - for example, what do I do when I come back from school? Put the coat and bag in the room, eat lunch, clear the table and tidy up the big stuff in my room. Other tasks we will split up into smaller tasks - for example “Maths” would be the header, with “Page 1”, “Page 2”, etc. will be the tasks. So how does the task board help us here? It’s simple! One of the Agile principles of managing the work flow is first to be able to visualize it. So our first step will be to do exactly that. Draw three columns ( to being with) on a white board. Our flow will be to have tasks that we need to do, those in progress, and those we have done. 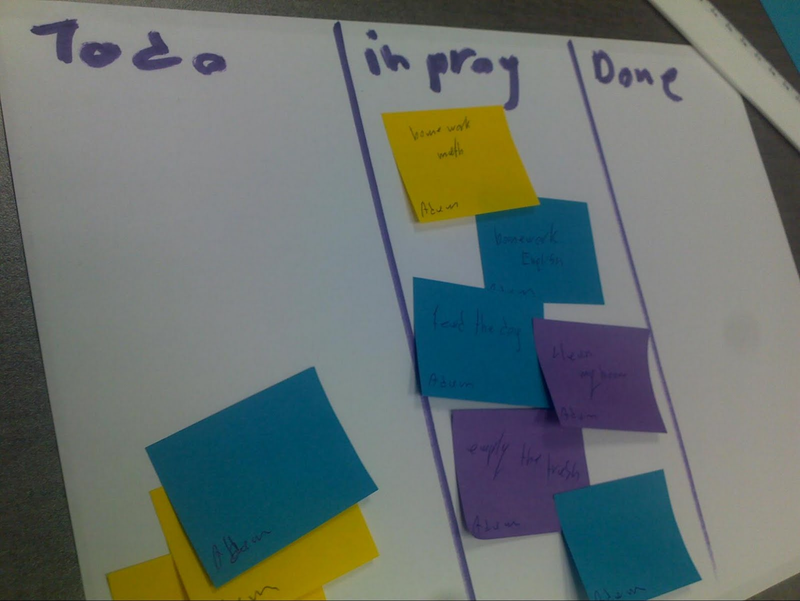 Put the tasks on the board, and you can visualize where you are today. In the following example. Adam has tons of tasks to complete, AND he’s expected to do his homework. No wonder he is stressed. This stress will probably cause him to drop everything, and try to avoid doing any of his tasks at all. 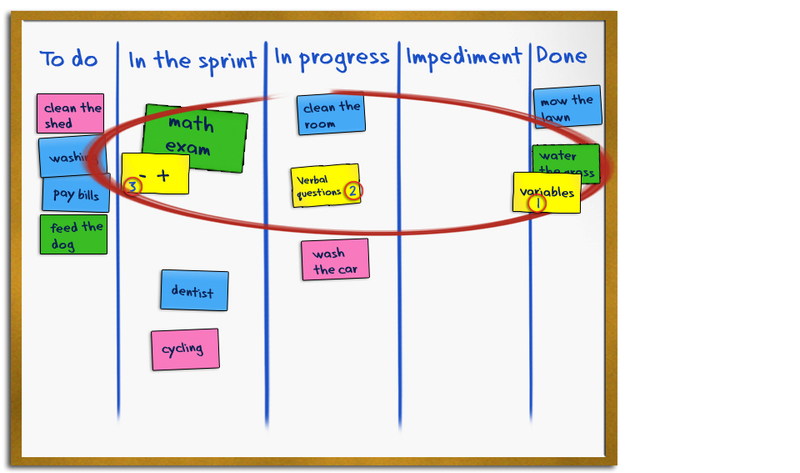 One of the main advantages of the task board is, that it makes our chore bottlenecks visible. Now we can place the tasks in the right order, and we can see if we are overwhelming anybody with their task load. The second, and not less important principle is to limit our Work In Progress, or WIP. This means that you can only have so many tasks that are in the ‘Doing /In-progress’ column at the same time. Sometimes limiting the tasks that are overloading our WIPs is the best way to get things done. Starting from doing one thing at a time (Yes, we can set more sophisticated WIP flows, but you are dealing with kids and basic principles, so keep it as simple as possible). Limiting our WIP load doesn’t mean you should stop doing things. It just means that you need to control what you are doing at the same time, in parallel, and limit it to what we are really able to handle. As all tasks are now visible on the board, we will make sure to do one thing at a time. Adding more and more chores to the ‘Doing’ column won’t help if you child is already bogged down with tasks, and starting more and more new tasks without finishing old ones only leads to delays and frustrations. 2. Decide what comes first (priority). 3. Divide tasks up into small chunks if possible. 5. Work on one task at a time. 6. Pull tasks from the “To-Do“ column only when your completed the previous one. So if you told your child to do lots of things at once, now you have a different method. Visualize everything you want them to do, give each task the right importance and priority, pull tasks only when you are done doing the last task, and you’ll feel how the sense of being under pressure is lifted. 1. Planning in advance the ongoing and repeating tasks, and placing them on the board. 2. 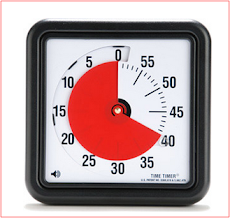 Limiting, prioritizing and timing those tasks to the right time and place. 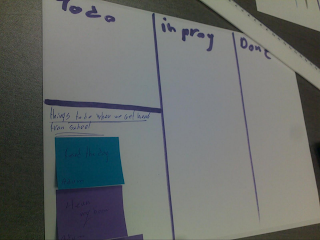 This way, instead of dropping all the tasks on the kids at the same time, when the kids get home they can see the task board and know what they need to get done. The child then selects one task after another, moving them into the ‘Done’ column when they are complete. Let's teach the child to divide into smaller tasks. Then visualize those tasks on the board, and decide together on right time to perform those tasks. ○ Identify our list of tasks /chores. ○ Identify the crowded areas or bottlenecks. ○ Plan tasks and chores that we know need to be done at a specific time in advance. ○ Divide to small chunks. ○ Stop working on other tasks, and focus on moving bottleneck tasks forward. ○ Do one thing at a time at our own pace. Want to learn more about Kanban?